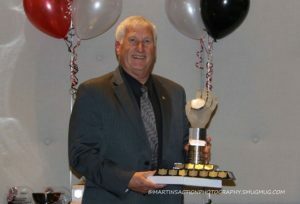 The Sports Car Club of BC held its annual Awards Banquet on October 27, 2018 at the Coast Hotel in Langley. The event, organized by Roland Stec and hosted by MC Ray Stec, was well attended by SCCBC members, spouses and friends. A list of SCCBC’s 2018 annual award and class championship winners are provided below. The club executive is grateful to all the volunteers and members that worked hard to make the 2018 season successful.